Businesses need chatbots for the obvious reasons that are – efficiency, reduced workforce and workload and fast processing of customer’s requests. If you are wondering that why is there a sudden need of chatbots when until now everything was manageable without it, then the reason is none other than extreme digitalization of businesses. As more and more consumers have started using digital channels, the incoming customer requests have also increased drastically. Companies need a larger workforce to manage all these requests resulting in extra costs with dangling customer satisfaction. Chatbots have the power to initiate and handle a human conversation based on a set of pre-defined rules and keywords. They also can learn and adapt as new information becomes known to them. All this adds up to some of the great benefits that all the businesses look forward to. A chatbot is a game changer in terms of overall customer satisfaction pushing the market to reach 1.34 billion by 2024. 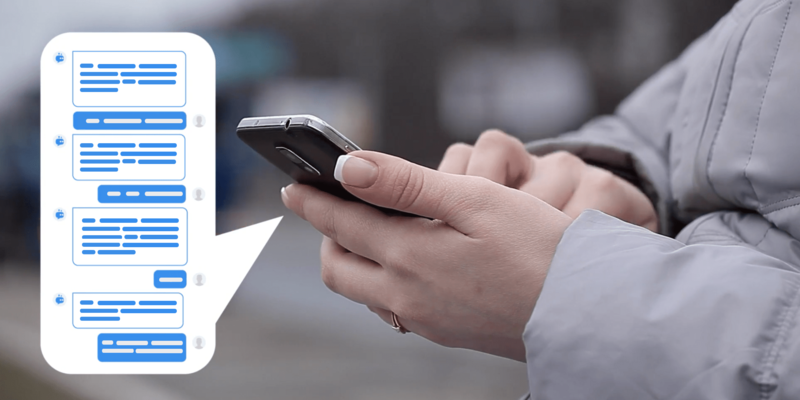 As per the reports, smart agents will manage 40% of mobile interactions by 2020. A myth surrounding chatbots was doing rounds that it is expensive and exclusive to only fortune 500 companies But, this is no more the case as it is predicted that by 2020, 85% of the chat interactions will be automated and will not need human intervention. In recent months, several new players like the virtual banker and progressive nativeChat have introduced schemes that help companies to set up chatbots within two weeks with reasonable investments. Also, 10K+ developers are building chatbots with the Facebook messenger. Making a customer happy is what all businesses need, and Chatbots serve this purpose adequately. They are capable of resolving customer queries in just a few seconds, so the wait times and queues are eliminated. It is a win-win situation for both the consumer and the provider as the customer get instant replies and provider saves some good bucks. By the end of 2018 automated customer agents will be able to recognize their customers through voice and face recognition. As mentioned earlier automated communication bring in new information and data that is used and analyzed by companies to make decisions. It is a great way to improvise a company’s performance based on these inputs and accordingly make their strategies for future processes and interactions. Chatbots are here to stay, and they are not going anywhere soon. The explorations around chatbots are still in progress and time is not far when one will witness some intelligent chatbots that can resolve complicated issues. Technology leaders are already working on artificial intelligence and machine learning basics to make intelligent chatbots that can offer much more than simple answers. If you are a business and you do not have thought about chatbots yet, then you are missing on a significant business opportunity. The significance of chatbots is already depicted in banking and marketing, and with time its influence will subsequently increase. Customers also expect chatbots and automated assistants from their business providers. They like to engage in live-chat as it helps them to get answers to their queries instantly. As of now chatbots is only used for simple conversation, but in the coming future, it will be seen handling complex decision making tasks. 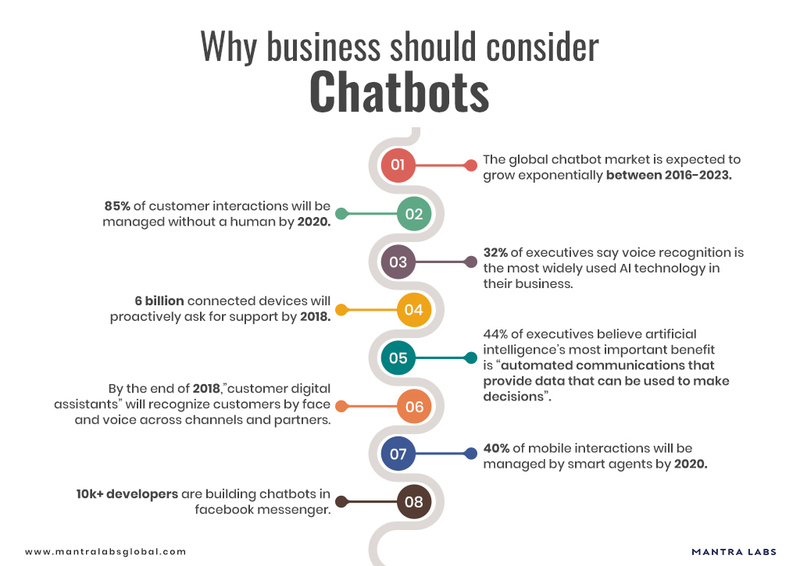 For any business, that wants to evolve and do not want to be a laggard should consider chatbots and make it an integral part of their business. If you have more queries on it, please reach out here at hello@mantralabsglobal.com.